Tranmere full-back Danny Holmes has signed a new two-and-a-half year contract with the League One leaders. The 24-year-old came through Rovers' youth system and after a spell with The New Saints. 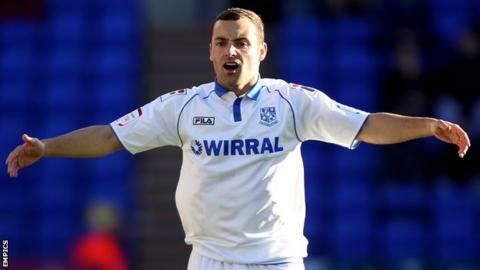 Holmes has since gone on to make 63 appearances for Tranmere, who face Leyton Orient on Saturday. Meanwhile, West Bromwich Albion centre-back Donervon Daniels has had his loan deal at Prenton Park extended until the end of the season. and has made nine appearances. "He's and he's played his part in some important wins," Moore told the club website. "He wants to learn and has got a fantastic attitude. I'm grateful to West Brom for allowing him to stay." And on Holmes's new contract, Moore added: "I've been delighted with Danny's performances since I've been back at the club. "He's developed into a really strong defender and I think he can still improve his game here. He's a local lad, he loves the club and he's the type of player you want to have in your squad."